Poland has pulled out of a summit in Israel after Israel’s acting foreign minister said “many Poles” had collaborated with the Nazis in WW2 and shared responsibility for the Holocaust. Prime Minister Mateusz Morawiecki branded the remarks “racist and unacceptable”. He had previously said he would not join today’s gathering of central European leaders in Israel but said no Polish officials would now attend. The leaders of the other three ‘Visegrad Group’ nations – Hungary, the Czech Republic and Slovakia – all still planned to attend the talks, Israel said, but Czech Prime Minister Andrej Babis said they would instead consist of bilateral discussions and the summit would be rescheduled for later this year. The spat between Poland and Israel has been escalating since Friday, after remarks by Prime Minister Benjamin Netanyahu suggested Polish complicity in the Holocaust. Many Poles still refuse to accept research showing thousands of their countrymen participated in the Holocaust in addition to thousands of others who risked their lives to help the Jews. 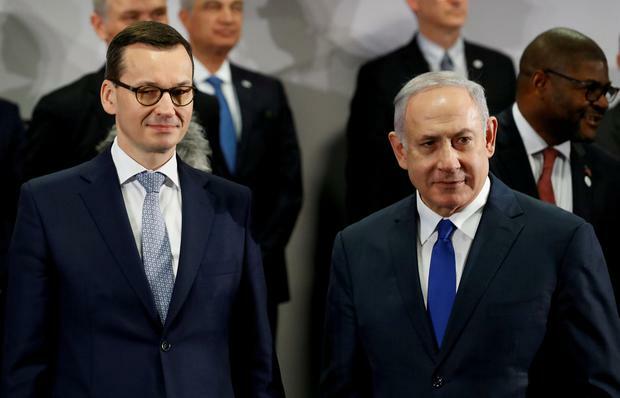 The Polish decision is a blow for Mr Netanyahu, who had hoped the Visegrad summit would burnish his diplomatic credentials ahead of Israel’s election on April 9. He sees the Visegrad-4 as a counterbalance to western European countries more critical of Israel’s policies toward the Palestinians. Mr Morawiecki said he was in “constant contact” with Poland’s Visegrad partners and said they understood Warsaw’s stance. Hungary’s Prime Minister Viktor Orban, a close ally, has also fostered good relations with Israel and was due to hold a meeting with Mr Netanyahu.